Food typography is the art of turning food into letters and words. Here’s a selection of my favourite artists and projects, all inspired by baking. If you like it, have a look at my Food Typography Pinterest board! Shouldn’t any time be baking time? Dina Belenko shoots conceptual still life images in her St. Petersburg flat, “telling magical stories behind everyday inanimate objects”. Source: Instagram. Copyright: Dina Belenko. Source: Behance. Copyright: Danielle Evans. Anna Garforth, a multi-disciplinary designer working and living in East London, started this as a self-initiated project. I love the bold message, the clever food pun and the great execution – I wish my biscuits held their shape like Anna’s! Source: Creative Bloq. Copyright: Anna Garforth. This wonderfully simple Victoria sponge recipe was born as a Creative Review ad for Smoke and Mirrors, Rockhound Photographic. Amazingly, it was styled in-house, pulling together people, ingredients and props to create a mouthwatering result. I love that it is nearly an infographic: no need for pen and paper anymore! Source: Behance. Art Direction: Grant Maycock, Lee Gladman. Typography: Grant Maycock. This wonderful pie was created to celebrate Thanksgiving for the blog A Subtle Revelry. In addition to being a show-stopper, the pie is easy to make: the recipe is available in full here. 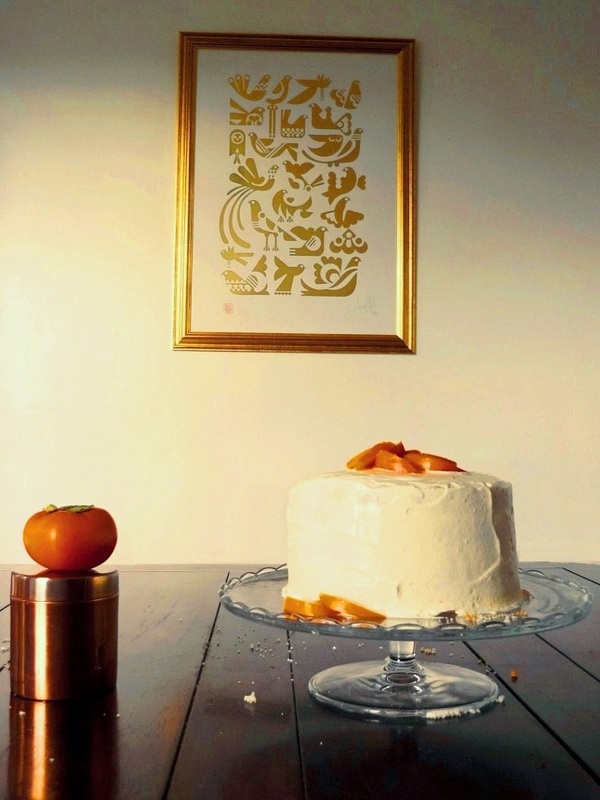 From the same website, here’s the recipe for a typography cake. Source: A subtle revelry. Produced and photographed by Athena Plichta. Source: Pinterest. Copyright: Nina Harcus. I have great respect for these typography buns – you need guts to make food typography out of yeasty dough that is supposed to rise in the oven! Source: Creative Bloq. Copyright: Fabian Björnstjerna. Source: Behance. Copyright: Molly O’Riordon. 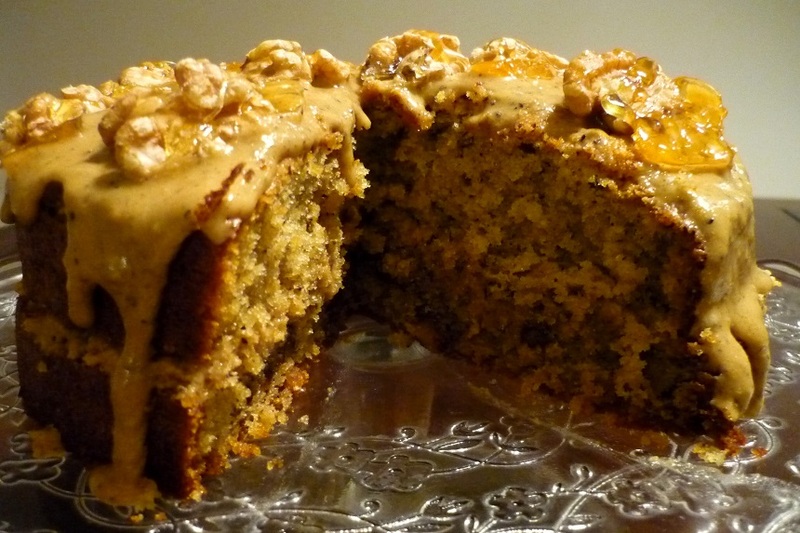 … and luckily enough, there is often cake at home. Source: Blog du web design. Copyright: unknown. Pancakes do not need to come round and flat. Source: Pinterest. Copyright: Mathias Torgaard. This post is a little late, as speculoos biscuits (speculaas in Dutch) are traditionally baked in Belgium and the Netherlands on the eve of St. Nicholas day, on 5th December (and I did bake them before Christmas). When it comes to enjoying them, though, there really is no need to be so strict. Thin and crunchy, they are the perfect winter treat to accompany a hot coffee or a glass of milk – in January as well! 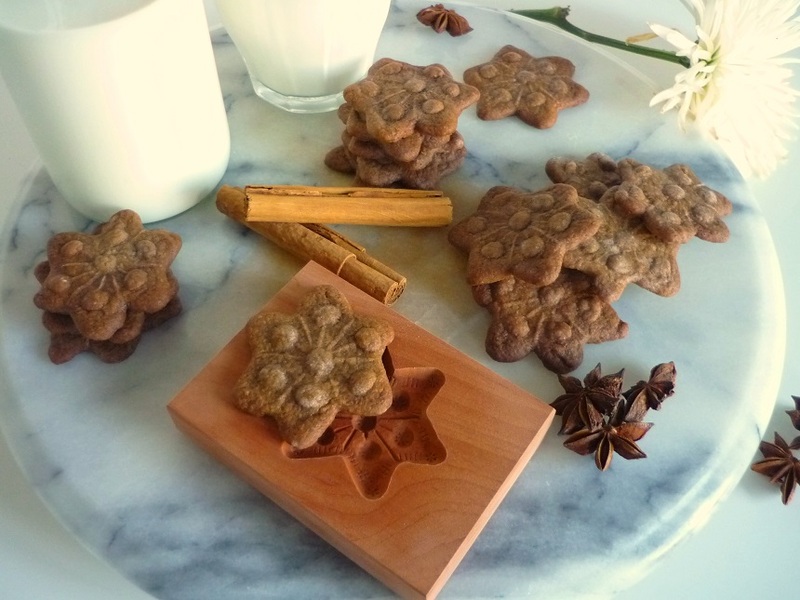 The speculoos spice mix is what sets them apart from gingerbread biscuits. Comforting cinnamon creates the body of the mix; cloves and nutmeg are essential to give it a little warm kick. For two tablespoons of speculoos spice mix, you will need: 4 teaspoons of cinnamon; 1 teaspoon of nutmeg; and 1 teaspoon of ground cloves. You can skip other spices completely or personalise the basic mix by adding a pinch of the one or two spices you like the most (ginger, cardamom, white pepper, coriander, etc.). 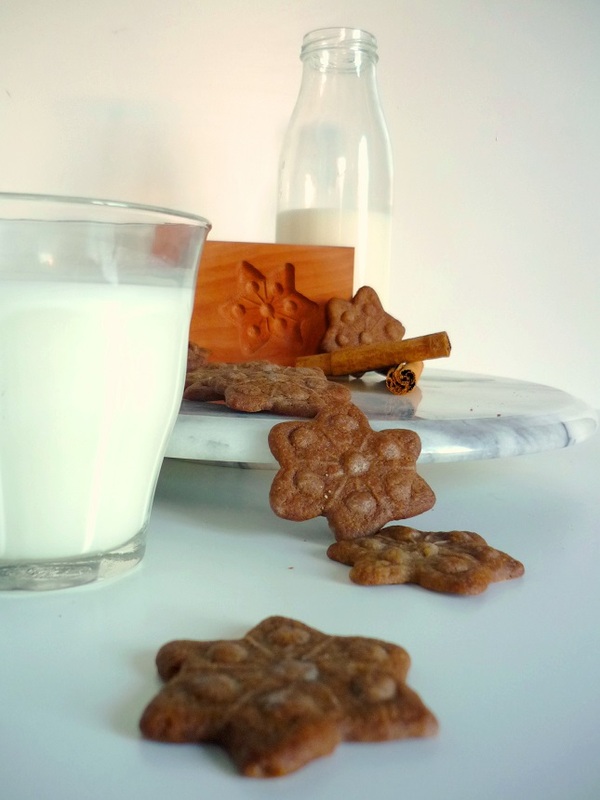 Traditionally, speculoos biscuits are stamped on the front with St. Nicholas’ image using handcrafted wooden moulds. In fact, the mould is such a part of the process that the word speculoos apparently comes from the Latin word for mirror (speculum), referring to St. Nicholas’ reflection. If you live in the Netherlands, Belgium or France, finding a speculoos mould should not be difficult; Dille & Kamille sells several online. If you live in Germany, a springerle mould will do the job just as beautifully. Anyone else can either bribe Central European friends or buy the moulds on good old Ebay: search for ‘speculoos mould’, ‘speculaas mould’ or ‘springerle mould’. Of course, you don’t need to use a mould at all: cookie cutters or even the rim of a glass will do. The dough can be kept in the fridge for up to a week and the spice mix can be kept for a few weeks in an airtight tin in a cool and dry place. 1. In a bowl, beat together 280g dark brown sugar, 300g soft butter and 2 tablespoons speculoos spice mix. 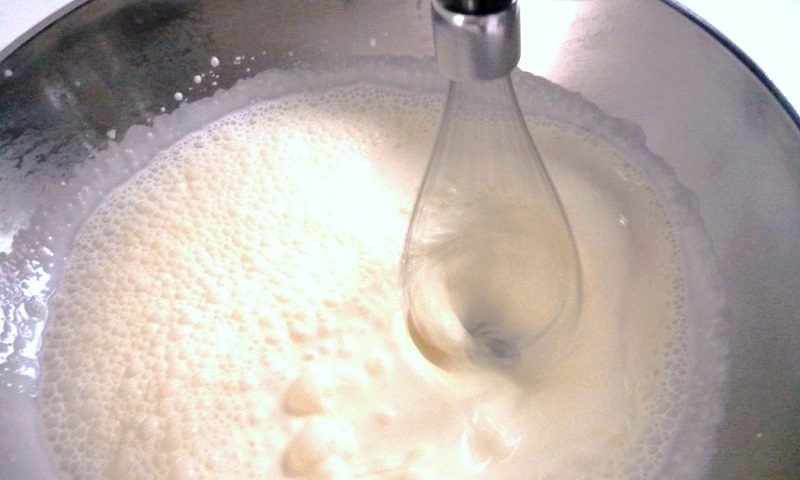 Dissolve the resulting cream into 70ml water or milk. 2. Sieve together 500g all-purpose flour and 2 teaspoons bicarbonate of soda. Sprinkle the flour over the butter mix and blend to get a thick, not too elastic dough. Be careful not to knead too much. 3. Wrap the ball of dough in cling film and let it cool in the fridge for at least two hours (or overnight). 4. About half an hour before baking, take the dough out of the fridge. Preheat the oven to 170 °C (160 °C for a ventilated oven). 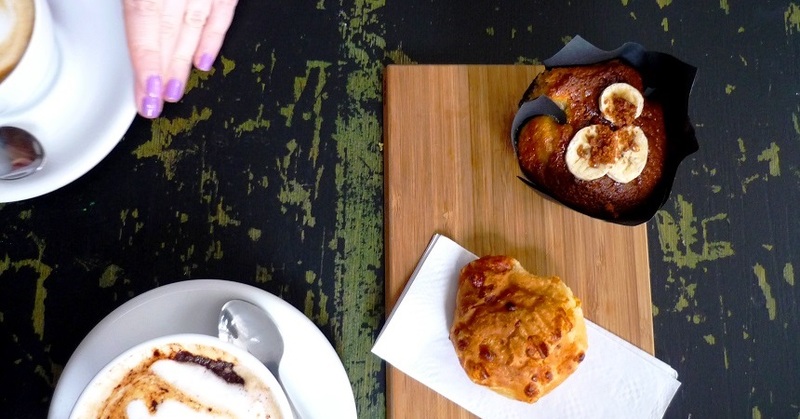 Cover your worktop with some baking paper (using baking paper rather than dusting with flour will keep the dough lighter and the worktop cleaner). Cut the dough into four parts. Cover the first one with some cling film and flatten with a rolling pin. 5. If you are using a wooden mould, lightly dust it with some corn flour. Press the dough into the mould with your hand to fit the design and cut the exceeding dough with a cutting wire or a sharp knife. Gently remove the dough from the mould by tapping the mould against the table or using a toothpick. 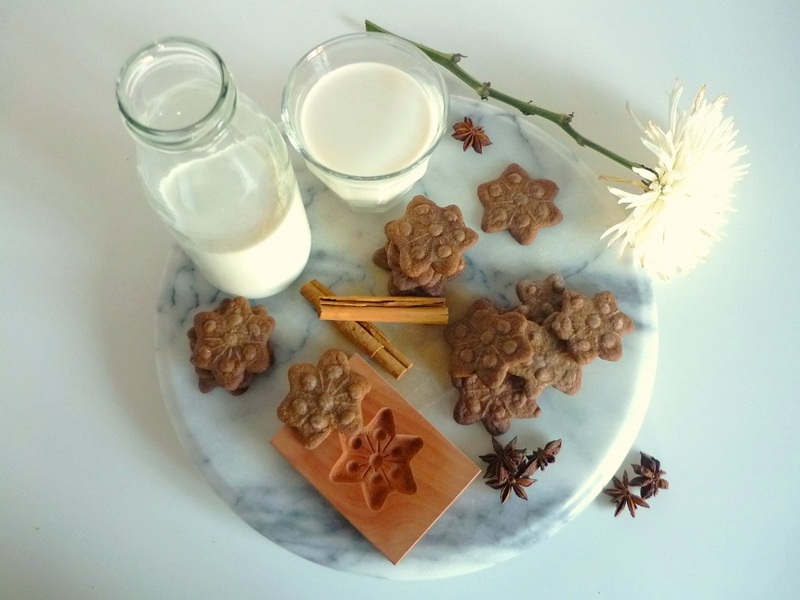 If you are not using a wooden mould, cut the dough into shapes using a cookie cutter or the edge of a glass. 6. Place on a baking sheet covered with baking greaseproof paper. If necessary, place in the fridge to cool for 30 min. 7. Bake at 170°C for around 10-15 min, depending on the size, until the speculoos are a deep golden brown . Turn the oven down if they are darkening too quickly. Apparently created at the time of the Duchy of Savoy, Mont Blanc (the dessert) is a little cone of chestnut cream vermicelli and crème Chantilly over a base of meringue, inspired by the shape and colour of Mont Blanc (the Alpine mountain). As if the idea of a snow-capped peak were not wintery enough, I though that the earthy chestnut and fluffy meringue flavours of the Mont Blanc would make a lovely Christmas log. Enter the sugar-capped Mont Blanc meringue roulade with chestnut and whipped cream filling. Is there anything more Christmassy than that? Although Christmas is all about indulgence, you do not want to use too much sugar in this recipe. The sugar in the meringue and the one used to make chestnut spread will be enough as sweeteners, so you won’t need to add more sugar to the chestnut filling or the whipped cream. Chestnut puree and whole roasted and peeled chestnuts are generally available in supermarkets and health shops in the UK around Christmas, as they are used for stuffing and soups. If you cannot find chestnut puree you can make it by blending roasted and peeled chestnut, adding a little water if necessary. Chestnut spread (crème de marrons), made with sugar and vanilla, may be more difficult to find in small supermarkets, but it is easily available online. The original Mont Blanc recipe calls for some rum to give a deeper note to the chestnuts. If you don’t have it, you can use some whiskey cream or just skip the alcohol. If you have never made meringue before, have a look at my post on French meringue for some basic tips. Compared to a classic dry meringue, a meringue roulade needs more sugar for elasticity and it is baked at a higher temperature. The rolling needs a firm hand: here’s how Baking Queen Mary Berry does it. PS: The lovely golden birds on the photos are by Danish designer Jette Frölich. 1. Pre-heat the oven 200°C/180°Fan/Gas 6. Line a large swiss roll tin (about 37×27 cm) with greased non-stick baking paper (note: this last step is not necessary if you are using a silicon tray). 2. In a squeaky clean, large bowl, start whisking 5 egg whites with an electric mixer on full speed. When they get foamy, add ½ teaspoon cream of tartar. Keep whisking and gradually add 275g caster sugar, one spoonful at a time: one third at the soft peaks stage; another third at the firm peaks stage; and the last third at the stiff peaks stage. Whisk until very, very stiff and glossy. 3. Spread the meringue mixture into the prepared tin in a uniform layer. Place the tin in the pre-heated oven and bake for about 8 minutes until very golden. Then lower the temperature to 160°/140°Fan/Gas 3 and bake for a further 15 minutes until crisp and firm to the touch. 4. Remove the meringue from the oven and turn it upside down on to a clean towel or a sheet of non-stick baking paper. Remove the paper from the base of the cooked meringue and allow to cool completely. 5. While the meringue cools down, prepare the chestnut filling by mixing 400g chestnut puree, 400g chestnut spread, 150g whole roasted and peeled chestnuts, roughly chopped, and 2 tablespoons of rum (optional). 6. 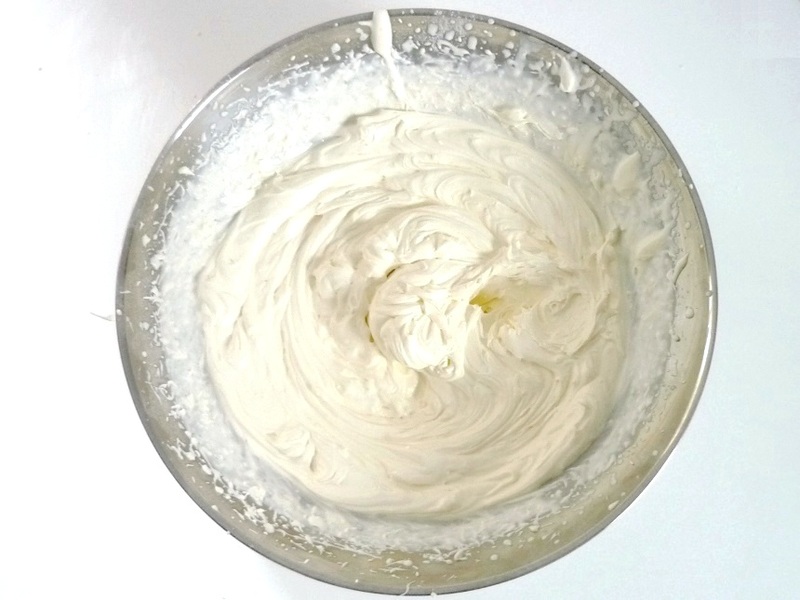 Whip 300ml fresh double cream. 7. Spread evenly the chestnut filling and then the whipped cream over the meringue. 8. To form a roulade, roll up the meringue firmly from the long end, using the towel or baking paper to help you. Make sure to keep the roll very tight. 9. Wrap in non-stick baking paper or foil and chill before serving. Serve dusted with icing sugar. I had the perfect autumn day today. It was a fresh crisp day, with a little drizzle in the air. I put my wellies on and went to the park for a little brisk walk. The leaves were all shades of gold and red and the dogs were playing in the mud. You get the picture! 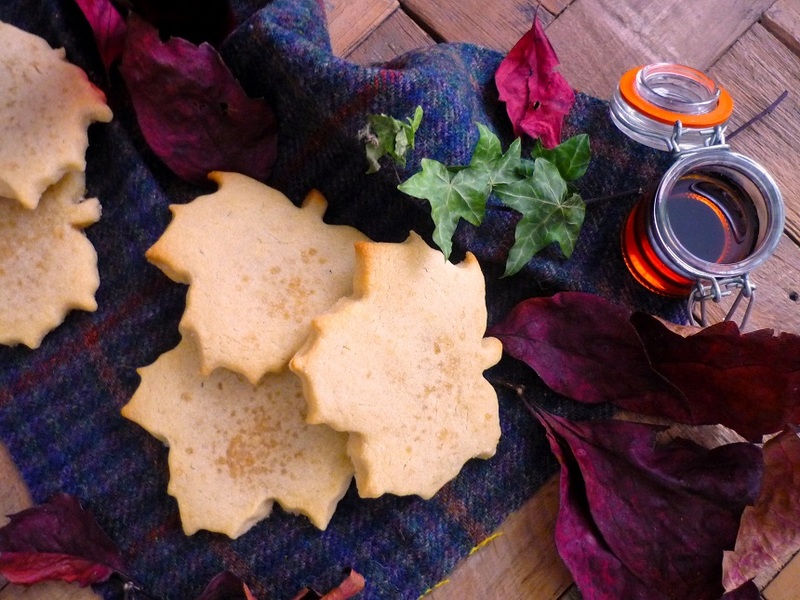 Once back home, I baked these maple syrup shortbread biscuits, just in time for Bonfire Night. They are great with a cup of steaming hot ginger and lemon tea! I have been planning to bake some maple syrup biscuits for some time, but it took me a while to find the right recipe. 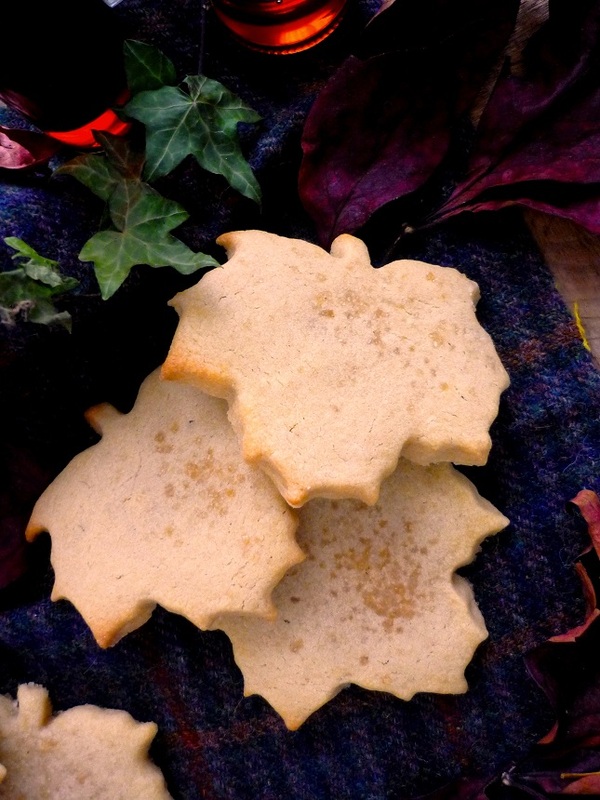 Mine is based on the traditional 1-2-3 shortbread recipe, but it replaces sugar with pure maple syrup and adjusts butter and flour accordingly. 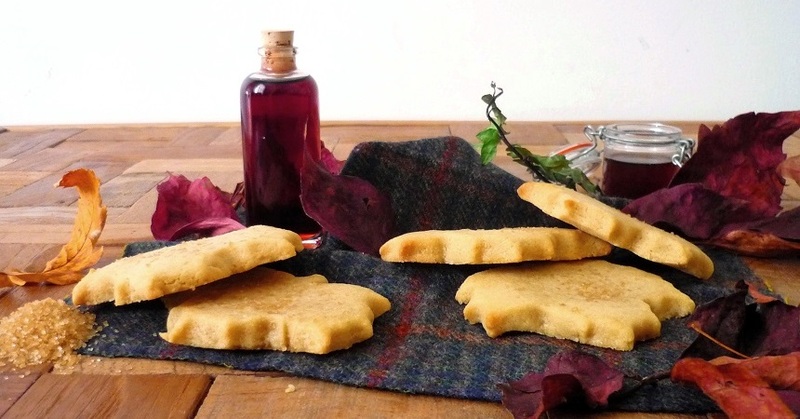 As maple syrup is liquid, the biscuit is less crumbly than a traditional shortbread. What makes or breaks these biscuits is the quality of the ingredients, so it’s worth using the best quality ingredients you can afford. Make sure that you use pure Canadian maple syrup (I used Shady Maple Farms’ organic 100% pure maple syrup). I used salted butter because I like to counter-balance the sweetness of the maple syrup; however, that’s just a matter of taste and unsalted butter will work just as well. For a good result, temperature is also key. The butter must be very soft before you start making the dough, or it won’t become creamy enough to mix properly with the maple syrup. That’s why it’s a good idea to dice it and work it on its own, before incorporating the maple syrup. Once the dough is mixed, on the other hand, you want to keep it cool to make sure that the biscuits keep their shape in the oven. . If it is a hot day, you may need to leave the biscuits in the freezer for 15 minutes after cutting them to make sure that they hold their shape in the oven. Beat 180g of butter, diced and soft, and 100ml maple syrup with an electric mixer until smooth (this will take about 3-5 minutes). In a separate bowl, stir together 275g of plain flour and ½ teaspoon of salt. Using a spatula, gradually fold the flour mixture into the butter mixture until completely incorporated. Squeeze the dough into a ball, wrap it in cling film and chill in the fridge for at least an hour (preferably two). Preheat the oven to 180ºC / Gas 4 (ventilated). Line a baking sheet with greaseproof baking paper. Dust the work surface with a little flour and gently roll the dough out to about 8mm-1cm thick. 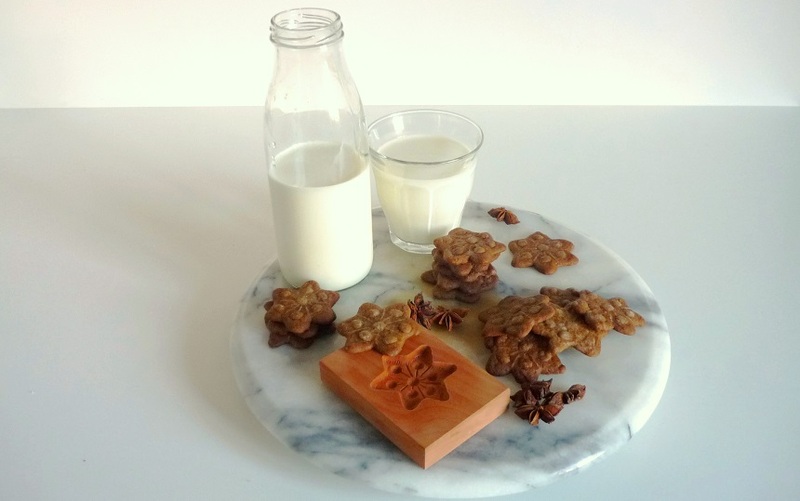 Cut into leaf shapes using a biscuit cutter. Transfer the biscuits to the baking sheet and sprinkle each biscuit with a pinch of brown sugar. If it is a hot day, leave in the freezer for 15 minutes to make sure that the biscuits hold their shape when baking. Bake for about 20 minutes. The larger and thicker the biscuits, the longer they may need in the oven. Once they are pale golden and firm and no longer stick to the greaseproof paper, remove from the oven and transfer the biscuits to a wire rack to cool. My grandmother had a persimmon tree in her back garden in Italy and I have always loved their sweet vanilla taste and firm, shiny flesh. More exotic than apple and pear and with a warm, golden orange colour, persimmon (also known as Sharon fruit) is my favourite autumn fruit. To welcome the new season, I combined it with cinnamon and organic apple juice, two traditional autumn flavours, for a light and creamy seasonal cake. In keeping with the Italian theme, I decided to go for a very simple Pan di Spagna sponge. Pan di Spagna is a traditional Italian sponge cake with a light and airy texture and only three ingredients: eggs, sugar, and flour. The basic Pan di Spagna sponge cake contains no butter, milk or oil, which makes it low-fat and perfect for a dairy-free diet. 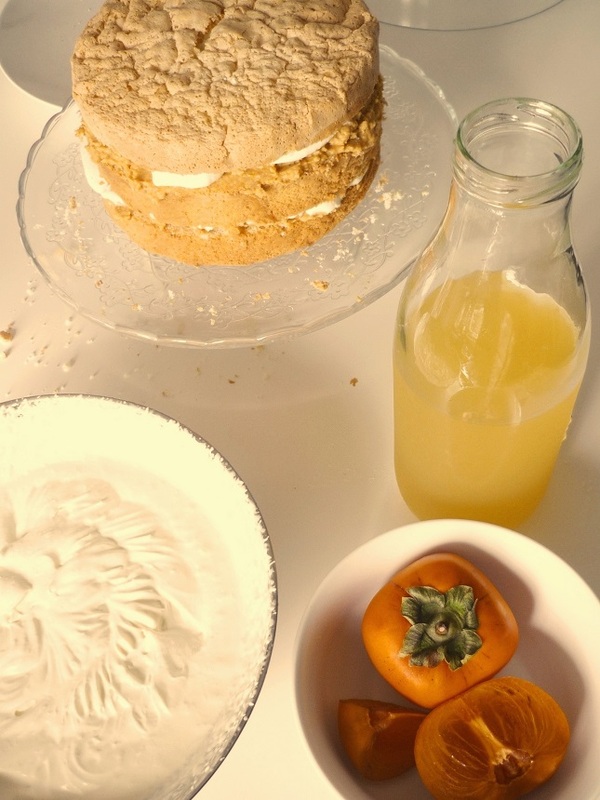 If you want to keep the persimmon compote dairy-free and low-fat as well, substitute the whipped cream with soya cream. Of course, you can also leave the cake naked or just add a sprinkle of icing sugar on top! There are different methods to make Pan di Spagna sponge: this recipe, based on Giallo Zafferano’s, uses the egg-separated method. Like angel cake, Pan di Spagna cake does not need raising agent: it raises thanks to the air and steam trapped inside the egg foam. Because the mixture needs to be as light as possible to raise properly, I recommend using a low-protein (weak) type of flour, such as US (unbleached) cake flour, Italian grade 00 flour or French T55 flour. 1. Pre-heat the oven at 180-160ºC. Grease and line with baking paper a medium round tin (18cm diametre). Sieve together 75g 00-type flour (or other weak flour) and 75g corn flour. 2. Separate the whites from the yolks of 5 eggs; this is easier when the eggs are fridge-cold. Take care not to leave any trace of the yolks in the egg whites bowl. 3. With a sharp knife, cut the vanilla pod in half lengthwise and scrape the seeds into the egg yolks bowl. 4. Whisk the yolks and the vanilla seeds with 100g caster sugar until the mixture doubles in size and becomes light and fluffy (see photo 4b for how it should look like). 5. Whisk the egg whites with 50g caster sugar and ½ teaspoon cream of tartar until they make hard peaks. 6. Using a large spatula, gently mix the egg whites to the yolks mixture. Take care not to overmix: you don’t want to knock the air bubbles out of the mixture. 7. Gradually sift the dry ingredients over the mixture, gently folding them in until they are completely incorporated. 8. Pour the mixture into the cake tin and bake at 180ºC for 40 minutes (static oven) or at 160ºC for 30 minutes (ventilated oven). The cake is ready when it springs back if poked with a finger. 9. Once the cake is baked, turn the oven off and leave it in the oven to cool down for about 10 minutes. Then take the cake out of the oven and let it cool completely before taking it out of the tin. 10. Cut 5 persimmons in small pieces. 11. Transfer the persimmons to a pan and add 250ml organic apple juice and 1 teaspoon cinnamon. Slowly simmer on a low heath for about one hour, until the compote reduces to the consistency of a jam. 12. Blend the compote in a food processor until smooth. Add 2 tablespoons whipped cream and mix well. Set aside. 13. Make the crème Chantilly by whisking together 250ml full-fat whisking cream and 50g icing sugar. 14. Cut the cake in three horizontal layers. 15. Drizzle 10ml organic apple juice over the bottom layer. Spread half of the persimmon compote and then a layer of crème Chantilly over the persimmon compote layer. 16. Place the second layer of cake on top of the first one and drizzle 10ml organic apple juice over it. 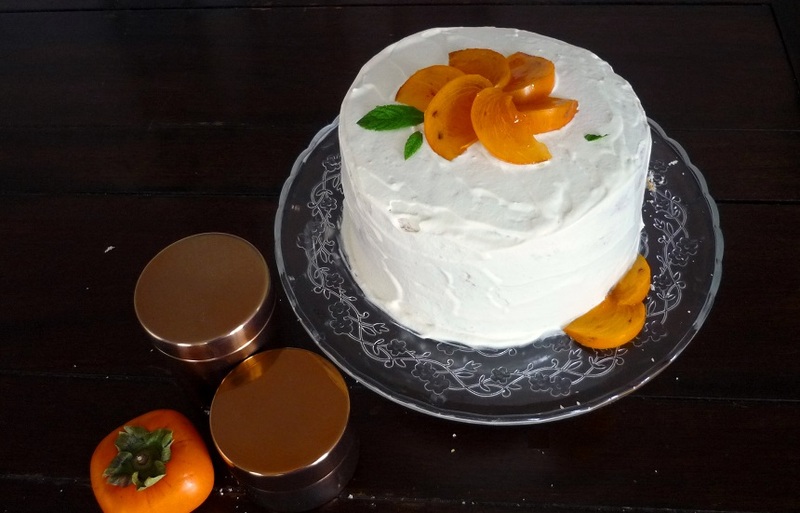 Cover with the remaining persimmon compote and a layer of crème Chantilly. 17. Top the cake with the third layer and drizzle the remaining 10ml organic apple juice over it. Spread a thin layer of crème Chantilly over the whole cake and leave to rest in the fridge for at least half an hour. This layer will create a smooth surface for the rest of the crème Chantilly to be laid upon. 18. Once the first layer of crème Chantilly is set, cover the cake with the remaining crème Chantilly. 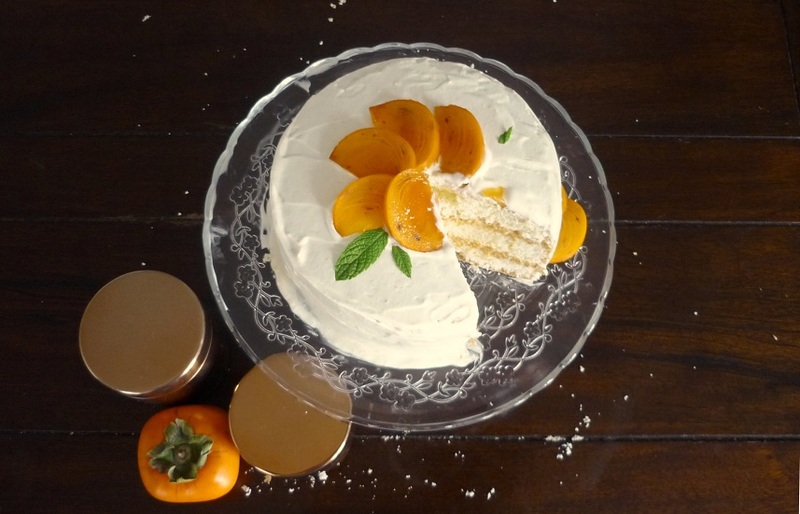 Decorate with one persimmon, sliced, and a few mint leaves. This cake keeps well in the fridge for 1-2 days. Essentially, crème Chantilly is sweetened whipped cream. Light, moist and very easy to make, it is my favourite dessert topping. 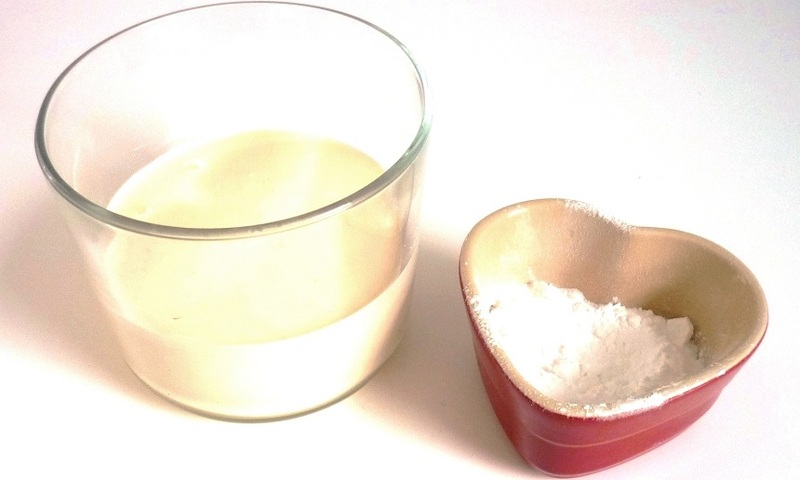 For best results, the cream needs to be full-fat and whipped when very cold. Leave it in the fridge until just before using it; if it is a warm day, you may place it in the freezer for a couple of minutes. Ideally, the bowl should be very cold too. For this reason, I use a metal bowl and leave it to chill in the freezer, empty, for about half an hour before using it. Once made, the crème Chantilly can be flavoured with vanilla seeds, cocoa powder, fruit puree, matcha green tea powder, etc. Leave a metal bowl in the freezer to chill for about 30 minutes. Pour 250ml full-fat liquid cream, which should be very cold, in the metal bowl and start whisking using a hand-held electric mixer. Add 50g icing sugar, one tablespoon at the time, taking care to mix it completely. Continue whisking until hard peaks form. This recipe is inspired by the coffee, cardamom and walnut cake in Fiona Cairn’s beautiful book Seasonal Baking (which I wholeheartedly recommend). 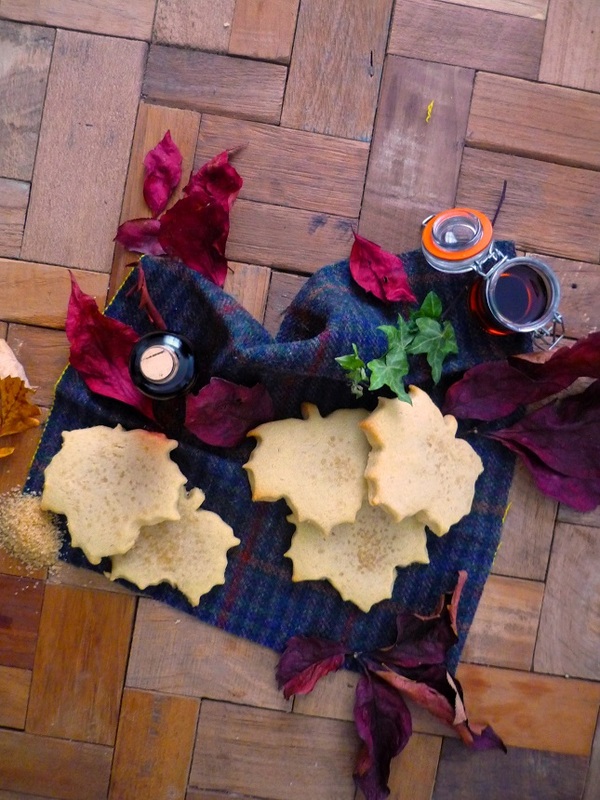 I love baking with seasonal ingredients and the caramel and walnut decoration reminds me of golden autumn leaves. This is the perfect cake to have with a warming coffee after a brisk walk in the park on a Sunday afternoon! In addition to making it dairy-free (of course!) I substituted the buttercream with a soya-based coffee and cardamom cream, which is lighter and less sugar-heavy. 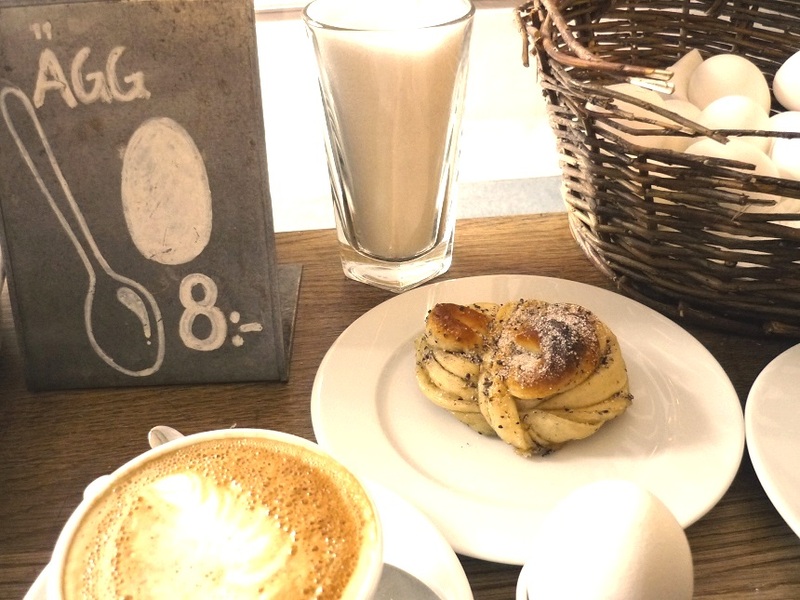 The round and warm scent of cardamom makes a good addition to autumn and winter bakes (have a look at my Swedish cardamom and cinnamon buns). For this recipe you will need the dark brown seeds inside the cardamom pods. Although supermarkets generally sells the green pods, rather than the seeds, there is no need to go through the fastidious process of de-seeding the pods, as the seeds are easily available online, including via Amazon. It is important to ground the seeds immediately before use, to keep their flavour intact. 1. Prepare the ingredients: cut 175g margarine in pieces and leave it out to soften; roughly chop 50g walnuts; sieve together 125g flour and 1 bag (7gr) baking powder. Grease a 20cm round cake tin and line with baking parchment. 2. Preheat the oven to 180°C / fan 160°C / gas mark 4. Keeping them separate, place both the 50g walnut halves and the 50g chopped walnuts on baking trays and roast for six minutes. Cool. 3. Using a food mixed or an electric whisk, cream together 175g margarine, 175g caster sugar and 1 tablespoon decaf coffee until very light and fluffy. Lightly beat 3 eggs, then add them to the mixture. Gradually add 50g ground almonds and 3 teaspoons freshly ground cardamom. Gently fold in the flour-baking powder mix and 50g chopped walnuts; don’t over-mix. 4. Pour into the tin and bake at 160°C (fan) for 60 min, or until a skewer comes out clean. Cool on a wire rack. 5. Prepare the caramelised walnuts: lay 50g walnut halves on a baking tray lined with baking parchment. Put 100g of caster sugar and 100ml of cold water in a saucepan and dissolve the sugar over a gentle heat, stirring with a metal spoon. Increase the heat to a boil, stop stirring and occasionally brush the sides of the pan with a pastry brush dipped in cold water, to prevent crystals forming. Boil until the mixture turns a beautiful caramel gold and has thickened. 6. Have a sink or washing-up bowl of cold water to hand. Plunge the base of the pan into the cold water, then, using a teaspoon, drizzle the caramel over the walnuts on the tray and leave to set. 7. For the coffee and cardamom cream, mix 275g icing sugar (sifted), 50g ground almonds and 3 teaspoons ground cardamom. Using a food mixed or an electric whisk, add 3 tablespoons decaf coffee and 3 tablespoons whipped soy cream. If it is too runny, add more icing sugar. If it is too stiff, add more whipped soy cream, until it reaches the desired texture. 8. When the cake is completely cool, cut it in half horizontally. Spread half of the coffee and cardamom cream over the bottom half, then place one half over the other. Spread the other half of the coffee and cardamom cream on top. 9. 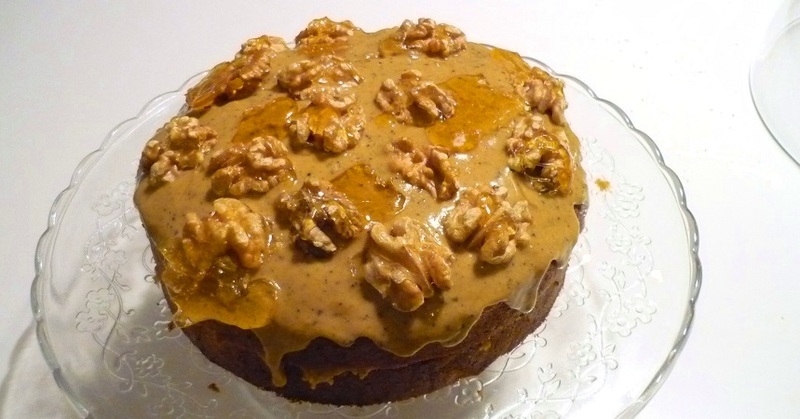 Decorate with the caramelised walnuts and the caramel shards. Enjoy! Have you ever wondered what to do with the red lentils that somehow end up forgotten at the back of the cupboard? A wonderfully moist and flavourful cake, of course! This is a very easy and quick recipe, slightly modified from a version published in Elle à Table, March-April 2014. 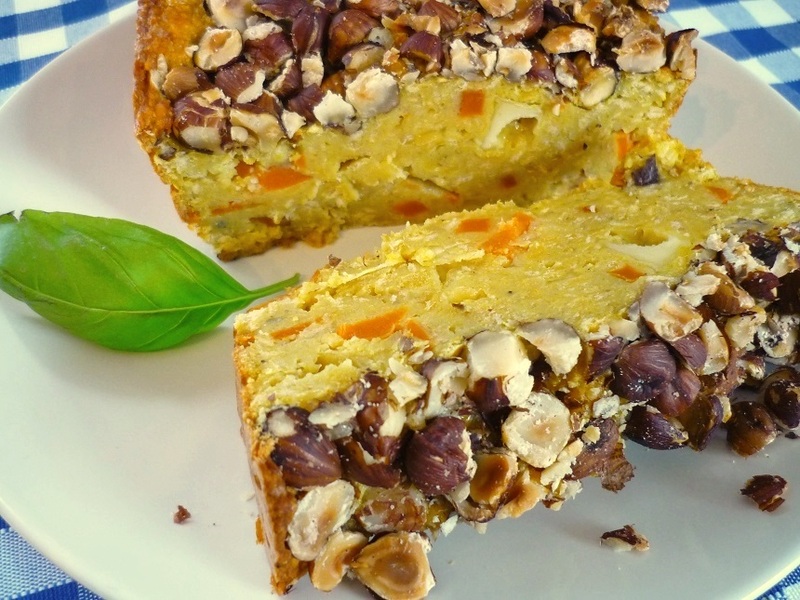 Allergy warning: this recipe contains eggs, dairy products, gluten and nuts. Pre-heat the oven at 170 degrees. Boil the lentils in plenty of water for about 10-15 minutes, adding a tablespoon of salt when the water starts boiling. Drain and keep on the side. In a pan, lightly fry the onion in a little olive oil. When it becomes golden, add the carrots. Season with salt and pepper and continue cooking for 5 minutes. In a bowl, whip the eggs with the grated cheese and the breadcrumbs. Add the lentils, the carrots and onion mixture, the olive oil and the curry powder. Season with salt and pepper. Butter and dust a rectangular cake tin with flour. Fill with the cake mixture. 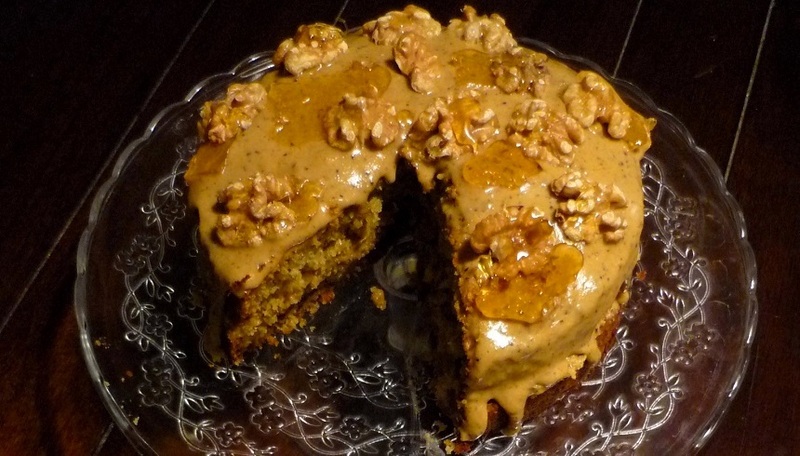 Sprinkle the cake with the chopped hazelnuts. Bake for 45 minutes, or until a skewer inserted in the centre of the cake comes out clean.